A new report from the Federation for American Immigration Reform (FAIR), provided exclusively to Breitbart News, shows that Texans are footing a massive financial bill because of illegal aliens in the state. A breakdown of the costs shows that illegal aliens in Texas are accessing a wide variety of public services they are not supposed to have access to, placing a burden on taxpayers throughout the state. For instance, FAIR found that annually the estimated 195,000 illegal alien students and 481,000 U.S.-born children of illegal aliens place an $8.5 billion burden on taxpayers for their education costs. Many of those students require special needs help with the English language, too, driving the cost even higher for Texas taxpayers. Taxpayers also pay $1.9 billion per year to fund Medicaid and other uncompensated healthcare programs that illegal aliens and their children are accessing in the state. Taxpayers spend another $1.1 billion to fund law enforcement efforts associated with illegal immigration. Means-tested social welfare programs for U.S.-born children of illegal aliens cost taxpayers another $47.8 million per year. Other basic government services for illegal aliens cost taxpayers $577 million more per year. FAIR estimates that any efforts to grant legalization to illegal aliens in Texas, which eventually would result in citizenship — as would happen under the Senate-passed “Gang of Eight” immigration bill and many of the plans that House GOP leadership is trying to pass — would exacerbate the impact on Texas taxpayers. Instead of granting them amnesty, which is giving them legalization, FAIR said the only way to save Texans’ hard-earned tax money is to reduce the number of illegal aliens in Texas. “Examining Texas’s fiscal outlays from the perspective of the current debate over adopting an amnesty for illegal aliens, we find that the fiscal burden to taxpayers would not be significantly lessened even if an amnesty like that proposed in the Senate’s S.744 were enacted,” FAIR wrote. In fact, it becomes clear that the only way to significantly reduce the fiscal burden is to reduce the size of the population that illegally entered the country. State and local policymakers have options available to accomplish that objective. 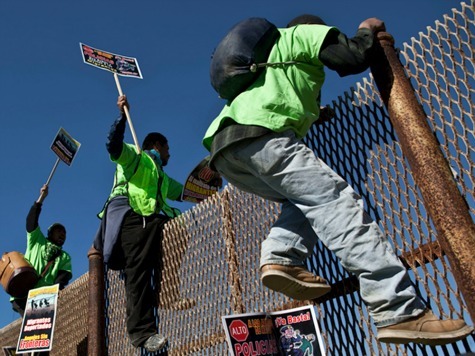 In Arizona, efforts to discourage the arrival of additional illegal residents and to hold employers accountable for knowingly hiring illegal workers have been effective in reducing the illegal alien population and, thereby, the fiscal costs associated with that population. In a press release accompanying the report’s publication, FAIR President Dan Stein said that the cost burden of illegal aliens on taxpayers amounts to money not being spent on Americans. Stein called on Texas lawmakers in Washington to stop pushing for amnesty, so as to protect the taxpayers in their state. FAIR spokeswoman Kristen Williamson told Breitbart News that the reason FAIR is honing in on Texas is because of how crucial Texas lawmakers are to any amnesty that House Speaker John Boehner, Majority Leader Eric Cantor, and Budget Committee Chairman Paul Ryan would try to move through the House. Two crucial committee chairmen — Reps. Michael McCaul (R-TX) of the Homeland Security Committee and Pete Sessions (R-TX) of the Rules Committee — are Texas members, while many other Republicans from the state command respect with the House GOP conference as a whole. FAIR wants to make sure the powerful Texas conservative grassroots has the information they need to battle the establishment’s push to cave on immigration legislation. “House Republican leadership cannot move immigration legislation without the support of the Texas delegation,” Williamson said. This report helps arm Texans with proof that taxpayers are paying dearly for this administration’s non-enforcement policies while Republican leadership stands idly by. Texas members should use their power and influence to lead the effort to enforce current immigration laws and reduce costly burdens on their constituents, rather than cave to special interest demands for amnesty and more foreign workers. The complete report is now publicly available on FAIR’s website.